The Ruler is laser cut for precision, has clear and concise markings and is made of heavy gauge acrylic. 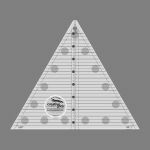 Take the guess work out of your projects, the 60 Degree Triangle Ruler makes it easy and accurate! 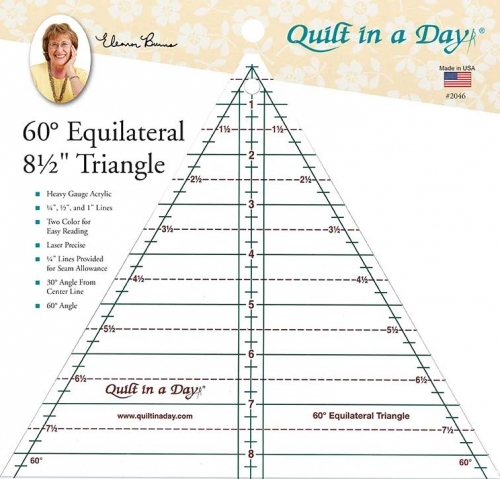 Quilt in a Day's 60 degree Ruler can be used with any designer's quilt pattern requiring an equilateral triangle. Finished sizes are from 1 inch to 8 inch, in 1/2 inch increments. 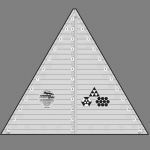 Refer to pattern, check what size finished triangles you need. Refer to chart to determine how many strips are needed to cut for desired number of finished triangles.